My birthday celebration continued yesterday. Yes, I'm spoiled. We went off to Bin 201 for a personal tasting for the entire family. Three birthdays were celebrated: mine, Mike's and Jeremy's. It was a Birthday Bash for the Boys. Bin 201 did an awesome job with the personal wine tasting. It was fun. The wines and the food selections were great. We were there for two hours getting a personal tasting of wines from Paso Robles, Barossa Valley, Spain, and Sicily. Afterwards though, we went across the street to Cadillac Ranch and I got to ride the bull. Really. I have never in my life ridden a bull. It was over pretty quickly. Thankfully and no bones were broken or bruised in the making of the video. Thanks to Chris, Nicole, and Nicole for setting up such a great evening. I noticed it this week in some of the trees on my street. The first signs of autumn's brilliant colors creeping onto the trees. 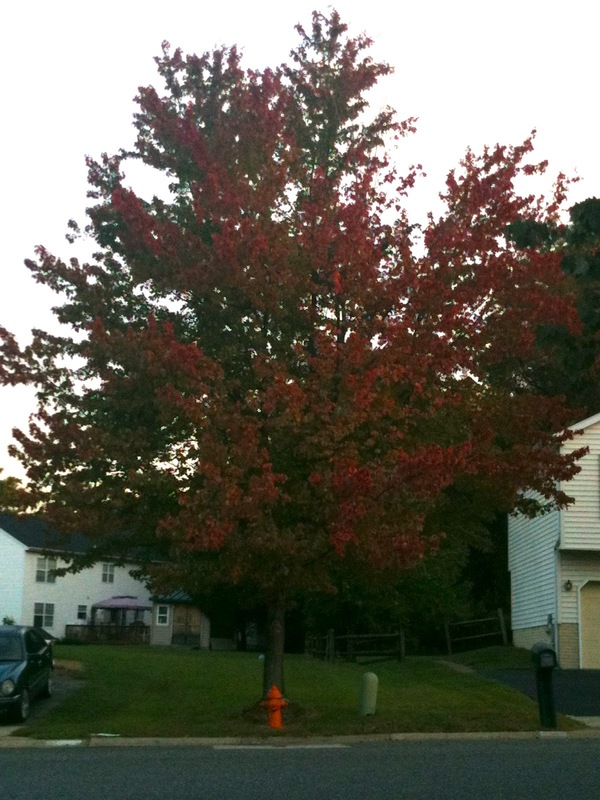 There is a maple tree at the top of the street which always seems to be the first one in the neighborhood to take on the color of autumn. And it has begun. It is a stunning tree standing alone and I see it often reflecting the first rays of morning light. Although now that the season has changed I am going to work in darkness and no longer get to enjoy it reflecting the golden rays of the dawn. I am noticing the color of autumn in other trees as well. The first hints of red on the edges of the leaves. Last Saturday, when autumn arrived, reportedly, Jax got up in the morning and was shocked to find the leaves still on the trees. He thought that magically, overnight, all of the leaves would fall from the trees so that he could play in them. Fortunately, we still get to enjoy the leaves as they change color before they fall to the ground. But, autumn is here and the colors are coming. 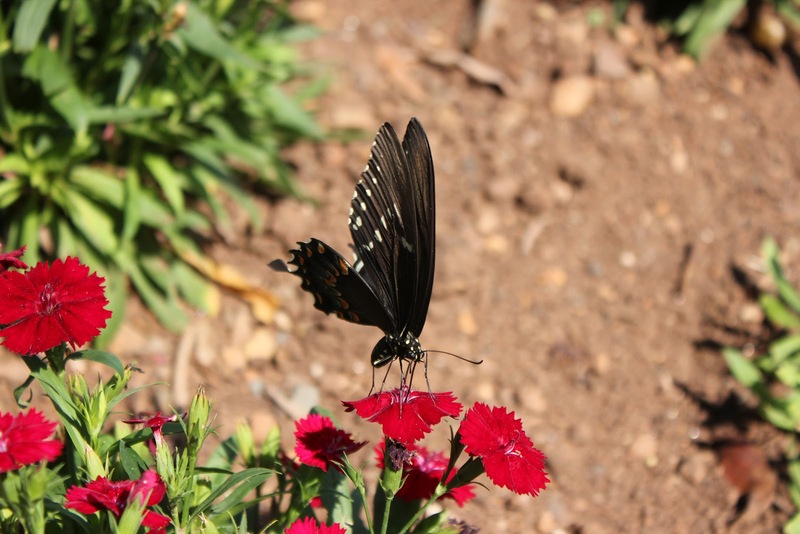 I could complain that summer is gone, but it is a lot more fun to find joy in the daily changes around me. They arrived yesterday and were waiting on my doorstep when I arrived home. 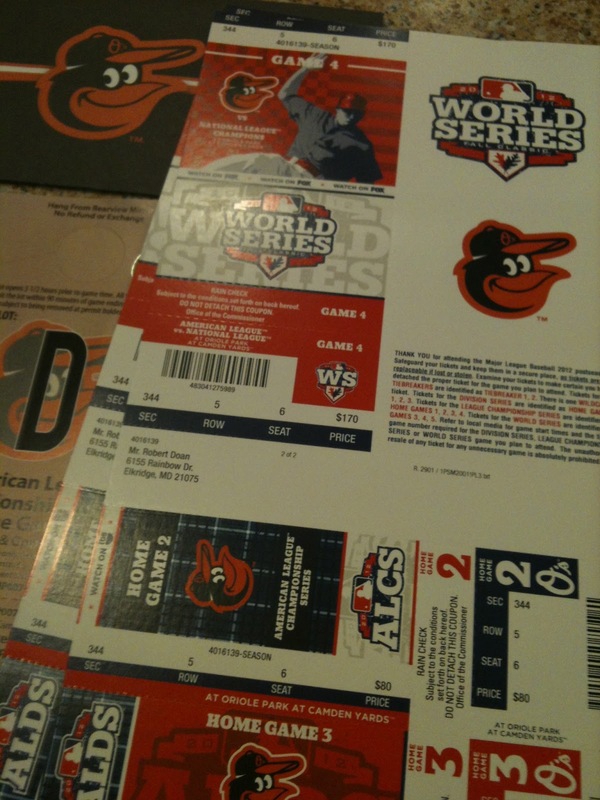 I have never held in my own hands tickets that provided admission to a World Series game. And even more, the two I have provide admission to a world series game for the Orioles, should they make it that far. I love dreaming. I remember springtime in Sarasota watching the Birds play during Spring Training. Wishing. Hoping, that this year would be the year. And maybe it will be. It is late September and we are still in the hunt with only a handful of other teams. The tickets seem magical right now. Six games remain in the regular season for the Orioles and they control their own destiny. Winning all six would be the best. Winning 4 of 6 would do the job. The team the pre-season pundits picked to lose the most games in Orioles history has already made history. But right now is the time to dream of meaningful October baseball, the play-offs and the World Series. Where do I begin? My birthday was yesterday and it was one of the most awesome birthday's that i have ever celebrated. I want to thank everyone who sent me birthday greetings. They were awesome and I am humbled by how many of you took time to send me a special greeting. The day was planned to be a full day. I took the day off from work, Chris had the day off as well, and we decided to do some things we haven to done in a while. I started in the morning by going to the Walters Art Museum. I throughly enjoy art and the Walters has some great pieces. There was no exhibit in town, just the permanent collection. 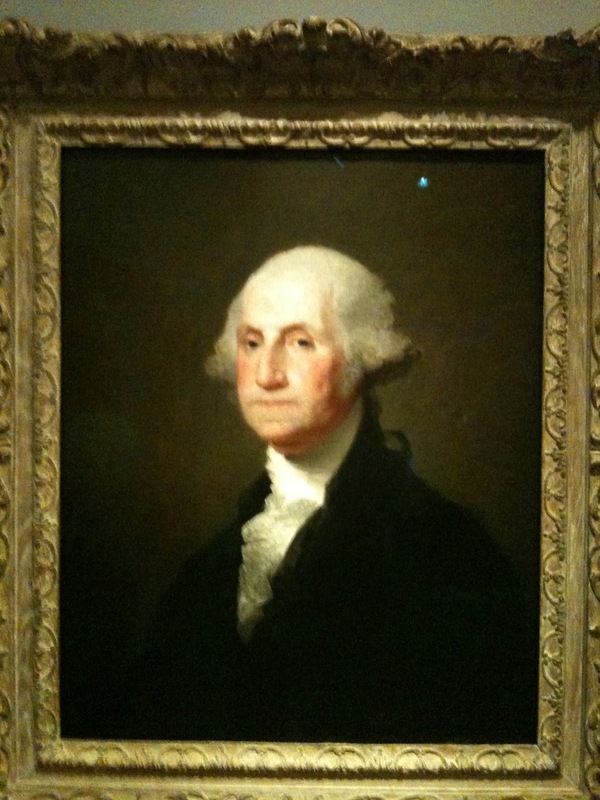 I enjoyed seeing the Gilbert Stuart Washington and paintings by Monet, just to name a few of the highlights. But I always get my mind expanded when I view art and consider the period and the subject. Then it was off to the new Clint Eastwood movie, Trouble with the Curve. A baseball movie, but more than that a movie about the special relationship between a father and a daughter. I highly recommend it. We finished the movie, headed home for a wardrobe change and then it was off to Camden Yards to see the Orioles wearing one one my birthday presents: a new orange O's jersey! Time to rock the orange at the yard. 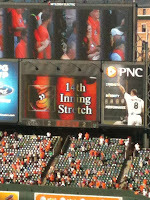 The O's badly needed a win to keep their post-season aspirations in tact and so this game had a play-off run feel to it. So there I was, with almost 27,000 of my new best friends watching a tense game through the top of the fifth inning. With the score 2-1 Toronto, the Orioles bats finally came to life and the nightcap of my birthday turned into a celebratory rout 12-2 Orioles. And in there somewhere I even saw my name on the scoreboard to acknowledge my birthday. Wow! What a day. Thank you to Chris for making it happen--especially the scoreboard and me name to celebrate my birthday as well as for being there all day. I may start taking my birthday off every year! It is a labor dispute. It is bigger than when the auto workers walk off. Bigger than when the airlines stop flying. It is unbelievable that the league and the owners don't notice that every passing day the fans grow more supportive of the referees and less supportive of the league. And the results on the field make their position more tenuous. There is just way too much money and prestige at stake. And some of the bad calls are really bad. I think it is taking on such importance because it provides a counter-point to the presidential elections which have been underway for two years, it seems. Maybe we will finally get a respite during late November. Politicians should take notice about what really gets the interest of the American public. Maybe they should begin using football terms when discussing foreign policy to generate the same kind of interest in things that really matter in the world? We are going deep against Iran on the next play. It is a full out blitz against the Taliban. The referee's strike continues in the NFL and the replacement ref's are under fire from everywhere: the owners, the coaches, the players, and the fans. Their product: sports entertainment, is losing its shine and turning to dust right before the eyes of the richest players in all of sports. And what is the real tragedy? That the over paid professionals cannot police themselves. They cannot play the game without needing officials for every call--no matter how obvious. What is this teaching our youth? Why do we tolerate such immature behavior from these overpaid sports "heroes?" Someone said it is all part of the game. Sunday evening, I saw Bill Belichick of the Patriots behave like a spoiled schoolyard ruffian. He even grabbed a referee after the game. I remember my high school football days--if such behavior had occurred then I am sure the league would have suspended the coach--immediately. I also remember our coach would not tolerate less than perfect integrity from the players and no fighting was ever allowed on the field. I remember one game when one of our players started a fight on the field. When he got to the sidelines the coach sent him home--right in the middle of the game. The behavior was not tolerated. Period. Why do our professional athletes not adhere to the same ideals? The tragedy of the NFL is that we now need officials to make every call, no matter how obvious, instead of just the close calls. Players should make the majority of the calls without the officials being needed. A fumble is a live ball and a dropped pass is an incompletion. Players know, why can't they make the calls instead of needing an outsider to make an independent determination. Wouldn't it be cool to see a player tell the ref that he dropped the pass, instead of acting like he made a clean catch? Sadly, he would be unemployed the very next day. That is another tragedy of the NFL. Too much money and too much emphasis on winning at the expense of sportsmanship. 1. I found a new way to celebrate the arrival of autumn--close the pool. 2. Visiting Fogo de Chao for the very first time Saturday night, I finally see what all of the fuss is about. 3. It was a beautiful and sunny weekend for working outside--and I did. 4. Baseball is all about winning more than a team loses. 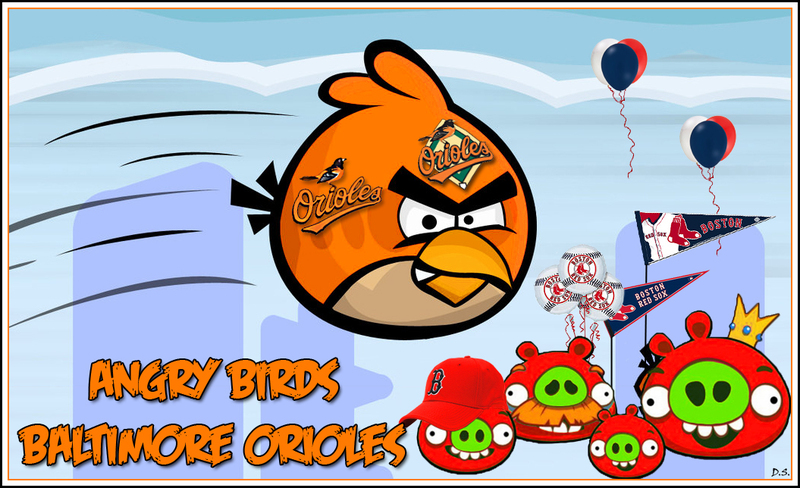 Even though the O's lost yesterday--they are still in control of their destiny. Ten games to go--and two tonight! 5. Tools are like toys, they both begin with "T."
6. A good project is one which winds up with a new shiny tool in the tool box. 7. The ratio of an igloo's circumference to its diameter equals Eskimo Pi. 8. I am still amazed when I look at the night sky and realize that the light from the stars I see began their journey to my eye years (tens, thousands, millions) ago--yet it is present in my here and now. Walking outside yesterday morning, I spied a spider enjoying a breakfast feast of some unlucky bug. The spider was fairly large--and in an accessible location. It was feeding outside near where I was celebrating the last morning of summer by closing the pool. It was fascinating to watch the spider, who seemed not to notice me as I took some images for posterity. I like spiders and am fascinated by their hunting skills. And they do hunt. Their lives depend upon it. Sometimes, it is really interesting to just enjoy their skills and watch them reduce the unwanted bug population--on dead bug at a time! Sometimes a successful auto repair actually happens within the confines of my garage. Last evening was an example. 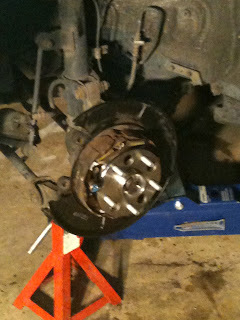 I completed a five hour marathon rear bearing hub assembly replacement on Chris's car. The same repair that I had started on Sunday morning and then been thwarted due to lack of the proper axle nut socket. The socket arrived Wednesday evening, as promised form Amazon, but I wasn't up for the challenge and so the remove and replace repair waited until last evening. Although I had a good plan, auto repair is fraught with unexpected delays. Last evening was no different. Everything went fine right up until the time to remove the bearing hub from the backing plate. No joy! The rust from the weather and almost 150,000 miles of use had effectively welded them together. For two hours, really, I worked with the assembly working to separate the pieces by brute force, creativity, frustration, and even prayer. They finally parted and I was able to begin the process of reassembly. Thankfully. The shiny new bearing hub was fit up and ready for installation. I was a bit miffed at the manufacturing process. I had read that some of the cheaper, non-OEM parts did not have large enough holes in them for a socket to get through to tighten the back bolts. So I bought a better quality OEM hub. Unfortunately, the access holes in this one were too small as well. This delayed the installation a bit as I had to creatively access the bolts to turn them down until the socket was able to be placed on top of the bolt due to tight clearances. But in the end, the job was completed and an extensive test drive confirmed the success of the repair. The droning sound heard while driving the car is gone. The new tires, which we thought were the source of the noise, are fine. I am not sure the $300 I saved doing the repair was worth the seven hours I put into it (considering the time driving around looking for the axel nut socket on Sunday and the two hours of pleading with the hub to separate from the backing plate last evening), but it is done! Chalk up an auto repair success and now for the next project--whatever it is. walking barefoot among the late summer foliage. yet captured in my mind, as a place of escape. Some ferocious storms blew through the area last evening. We had been suffering from a mini-drought and the lawn was beginning to show signs of stress from the dry heat and sun., so at least the rains, if not the wind, was welcomed. I didn't have to mow this week. I guess that is a plus. The dry conditions hopefully will change as September fades into October. After the storm, the pool was a mess again--the sycamore trees are beginning to give up their leaves early because of the dry conditions. Many of their leaves now adorn the surface of my pool. I definitely need to close it up this weekend and bring an official end to the summer fun. I think I am procrastinating. I enjoyed walking barefoot in the yard during the storm, being dispatched to the garden for some oregano, and feeling the soft earth giving way beneath my feet. It was rock hard just yesterday. As I departed out of work last evening a large number of people were waiting under the awning for the rains to subside. I smiled. I love rain and walked past them right out into the fury of the storm. I made a point of walking, not running, to my car so that I could enjoy the raindrops slapping my face and careening into my clothes. Smiling, because the raindrops do not care where they land. Even if I run, others are waiting. They bring me joy. It was a September storm with warm rains--unlike November's storms which are cold and numbing. Something else to enjoy as the season winds down. 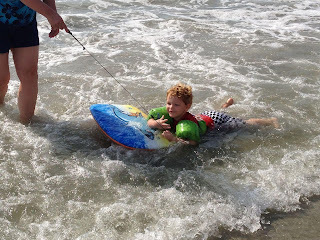 I saw an image of Lucas riding in the surf Myrtle Beach surf the other morning. It made me laugh. I remembered my own visit to the ocean during July and the fun and frolic that being on the beach provides me to escape the realities of work and life. How strange that I feel the need to create order from the chaos of the wind whipped vapors that are the clouds. 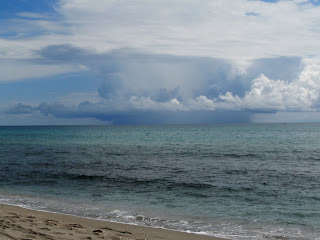 The color of the water changes as the clouds pass overhead make the ocean either inviting or foreboding. I think this cloud looks like a dog--a pointer focused on its target with its tail straight out. To imagine. 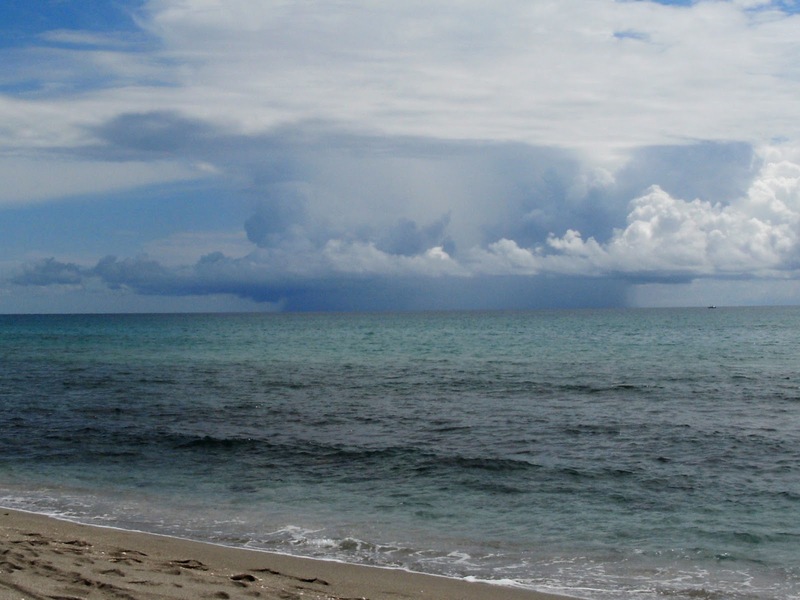 To lay on the beach and enjoy the lapping of the waves, the warm breeze, and the bright sun. And the clouds to stimulate my imagination. They are the best times! 1. Believe it or not, September is more than half gone. Where has it gone is the question in my mind. 2. Heard in a movie-- Yes we are going to die. You are going to die. I am going to die. The crew of this ship is going to die. Just not today! 3. Football is a tough sport--one play and a short second make the difference between winning and losing. 4. I have been fascinated by the fury surrounding the pictures of Kate Middleton. It is sad that people need to go to such extremes to secure privacy. I think most of us take privacy for granted. 5. The weather the past few days has been fabulous. These final days of summer have been inspiring with the crystal blue skies and moderate temperatures combined with low humidity. I wish I could bottle them up and save them for days which are not so nice. 6. Car repairs should not be attempted when in a hurry. Frustration. Whenever I need to be frustrated beyond belief, all I need do is attempt auto repair. At least the garage was clean, so I had a nice environment to work in and have my tools near me. That is something that hasn't happened in a while. Usually I'm on the asphalt in the driveway, in the sun or rain. That was where the happy notes for this project ended. Chris' car needs the wheel bearing replaced on the right rear. Not a seemingly big deal and I found step-by-step instructions. But when I started the project what was the first thing I found? The lug nuts were so tight that I couldn't budge them. Really! Mr. Tire must be using Mr Universe to tighten lug nuts. I even called Patrick over to give them a twist. No joy. Off to Lowe's for something to motivate the lug nuts. An air hammer and a piece of pipe to use as a breaker bar came home with me. Even with the reinforcements, the lug nuts were not easily persuaded to allow themselves to be removed from the car. I wound up using the pipe and almost standing on it to get them moving. That entire process took almost two hours of an expected four hour repair. 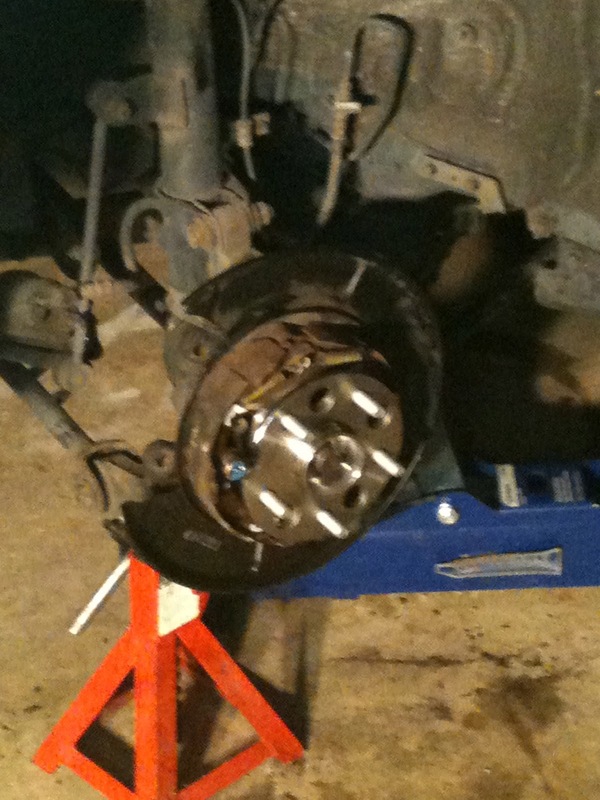 Next was the removal of the caliper and the brake pad holding mechanism and the rotor. Yay, that went extremely well. Now for the axle nut. All I needed was a 12 point 32mm socket. I knew that in advance and I had that. Oops! It needed to be a deep socket. I have a 32mm 6 point deep socket. No good. Off to the auto store--surely they will have one. Nope. Off to Home Depot. Nope. Off to Sears. No joy. I called Pep Boy--none there either. My 32 mm, 12 point deep well socket will be here Tuesday, I ordered it from Amazon. The car has been reassembled and can be driven for the next couple days, and then I get to do it all over again. Did I mention that the garage is clean? For the first time in years, we are having a hard time deconflicting sporting events across different sports instead of just teams. It is a good problem to have. Today we are faced with soccer vs wine tasting. OK--so wine tasting may not be a sport, but it does take up time when planned. Two of the grandsons, Ethan and Jax, have soccer games this morning followed by a trip to Annapolis for a planned event tasting Southern Italian wines. At least there isn't time to close the pool! Tomorrow, Sunday, about 4pm is a catastrophe. The Cowboys play, the Redskins play, and more importantly, the Orioles are facing a huge challenge in Oakland. They fumbled the baseball a bit last evening and lost only their eighth one-run game of the season. I am almost wishing for Monday to escape the completing schedules insanity. I may just have enough TV's and inputs to cover all of the events. At least the Ravens play in an open time slot in my life. Somewhere in there the lawn needs to get mowed, groceries purchased, and some relaxation and book reading need to be accomplished. 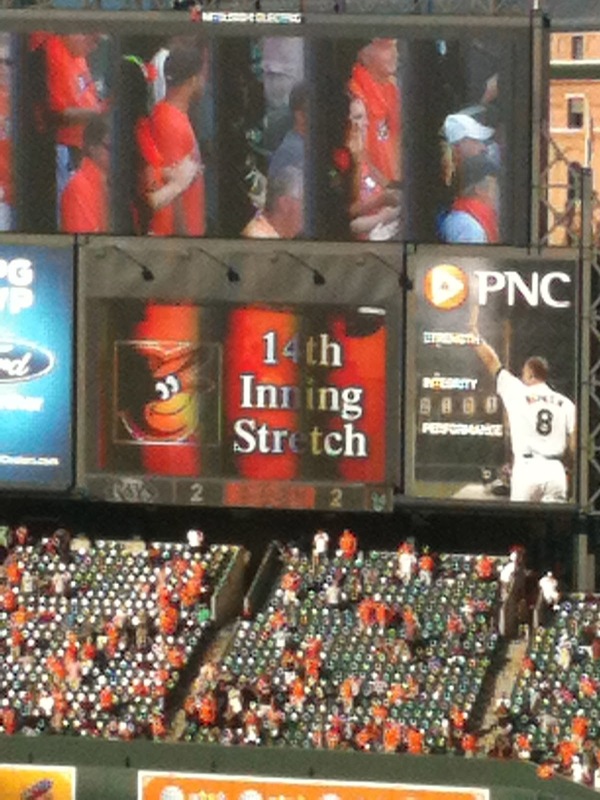 I attended the Orioles baseball game against the Tampa Bay Rays yesterday at Orioles Park at Camden Yards. The game lasted 5 hours and 14 minutes, officially, going into the 14 inning before ending in a victory for the home team--the Orioles. I don't normally get to enjoy 14 inning baseball games from start to finish, they usually end too late for me to stay awake, but this game began at 12:35pm with me in attendance at the park on a beautiful day with the Orioles playing meaningful September baseball for the first time since 1997. The day began with the O's tied with the New York Yankees, the thugs of baseball--and ended with the pressure cooker that is the end of the season squarely on the Yankees who were playing the Red Sox and eked out a win of their own to remain tied. The game had the feeling of a play-off game--which although it wasn't, the implications were huge. The Orioles were trying to sweep the Rays in a three-game series and keep the heat on the Yankees who seem to be cracking under the pressure of season ending baseball. At the end of the day, the win assured the Orioles of their first non-losing season since 1997. The Orioles ended the day at 81-62, 19 games over .500 with 19 games left to play. A huge triumph for a team picked by the pre-season pundits to finish with possible 110 losses. I sat through the game yesterday almost unbelieving. The score was tied at the end of nine innings 2-2, every batter and every out was critical. I watched the Orioles blow a 2-1 lead at the end of seven innings. I saw the team battle in a manner I have not seen in years. The winning attitude is here. When I arrived home after the game, my house was decorated appropriately by Patrick and Tina--complete with brooms by the front door for the sweep of the Rays! I thought the Orioles on the garage door was an especially nice touch. Although it would be easy to call the season a success--this team and its fans want more. There is even talk of winning not only the division form the hated Yankees--but the World Series. I love to dream--but sometimes, dreams come true. But for now--yesterday was a win during a long 162 game season which signaled the end of over a decade of impotence and frustration. I celebrate with the city and the region the return of a proud baseball franchise to relevance. And, I am just happy to be along for the ride. I an still trying to wrap my head around the violence taking place in Libya and Egypt that has resulted in the death of brave Americans who were there trying to help the people of the region obtain freedom and safety from oppression. How could the Libyans forget so quickly that it was the United States that helped lead them out from under the oppressive policies of a dictator and into self control of their government? Same for Egypt--where although the U.S. did not take an active role, we quickly embraced the new government and offered assistance. And this morning I read that the violence against Americans has spread to Yemen. Why are the people of the U.S. seen as pariahs while those who daily foment violence and chaos seen as liberators? And they kill their own. Why is the world so upside down? All of this is because of an inflammatory film? Really? Are they that insecure in their faith? Is their god not big enough to shrug these slights off? I have seen and heard a lot of inflammatory statements made about and against my God--but I know that my God is bigger than weak and feeble-minded statements made in ignorance and I also know that we humans are imperfect to begin with. My God is a God of forgiveness. Just ask! I am sure that I am on their list now for questioning the omnipotence of their god. I read that it is not a popular thing to do. But this morning I mourn the loss of brave, devoted American patriots who were killed doing their jobs for ungrateful peoples in places of the world that I have no desire to visit. I am beginning to understand that tolerance is a foundational building block of civilization. We cannot consider ourselves civilized without appreciating diversity. I am amazed at how it sneaks up on me during September. Hanging there in the pre-dawn sky yesterday morning Orion made his presence known to me as I was returning to the house after Makayla's morning walk. I am always happy when Orion finally disappears after transitioning to the evening sky. It means Spring has returned. For now though Orion's return signals that the dark, cold times are on their way. The constellation is stunning though. Besides the Big Dipper, Orion may be the most recognizable constellation, although Cassiopeia is a close second. I enjoy the way the imaginary hunter watches over me. Some of the stars that comprise Orion are friends as well. 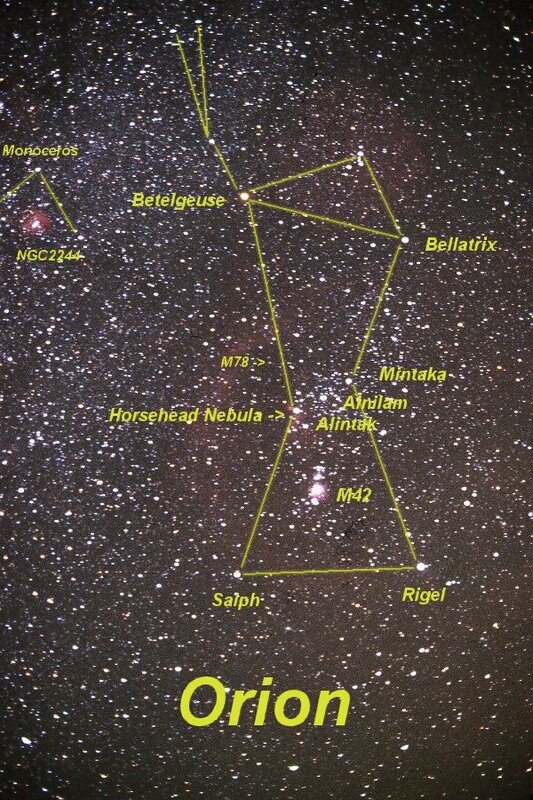 Betelgeuse and Rigel are my favorites. The return of Orion means pool closing is at hand. The leaves will don their autumn gaiety soon, and the snow and cold of winter are not far behind. So much cold and darkness before the return of moderate temperatures. And all because Orion has returned. Patrick took a really cool image of Camden Yards while we were at the game on Sunday. It is a panoramic image. It shows so much of how this season is different for the O's. This is a September game with over 46,000 people in attendance-and most of them are wearing orange! Not blue or red. On the very right side--in the orange you can see myself and Jeremy watching the on field activity intently. A beautiful September afternoon--puffy white clouds in a beautiful blue sky. A perfect day for baseball. If only . . . Sadly, the image was taken during the 8th inning when the Orioles defeat was assured and so the stands are beginning to empty. But September isn't over yet. Good things are going to happen. 1. It is really demoralizing to leave a baseball game after 40,000 fans showed up but the team didn't and wound up getting blown out. On top of that, the O's lost to the Yankees. 2. 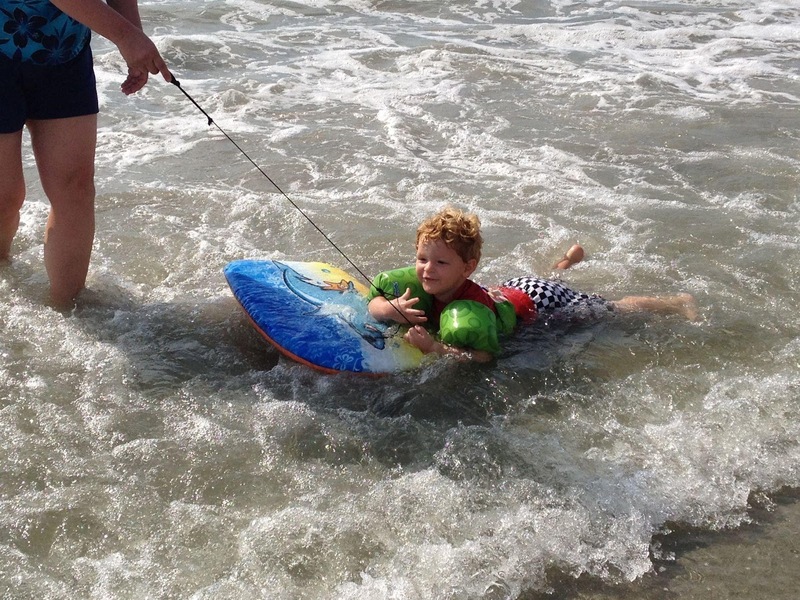 There is something depressing about realizing that the end of summer is as close as it is--and it was a great summer. 3. We had a loud humming noise associated with a new set of tires on Chris' car only to find out that we have a bad wheel bearing. I have some work to do. 4. Opening Sunday of the NFL season and I was at a baseball game--how cool is that? So much for Sunday Ticket. 5. Makayla had a check-up last week--she has bad knees. Otherwise, she's healthy but still freaked out about the wood floors. They don't give dogs anti-anxiety medicine. 6. An amazing thing happened on Friday while trying to get back home after a week in Denver, I called to change my travel reservations less than six hours before the flight I wanted to got on--and they had a seat and I pulled it off, getting back a whole day early. 7. I'm not very happy with my Samsung Blu-ray player. It won't update itself and none of the special features work. It is only a year and a half old--and now all it will do is play Blu-ray's and DVDs. It was out of warranty in March. I called Samsung support for help--and they didn't. 8. I was reassured by the news that Congress is returning to work this week after their five week vacation. I wonder, will they really work? Sitting together for breakfast this morning, Chris uttered the words that signal the end of summer to me. "Bob? What are we doing next weekend?" I responded too quickly, "I think next weekend is open, why?" And then she had me, "I think we should close the pool, the nights are in the 50's and so it is going to be too cold to swim. And the leaves are going to be falling off the trees soon." Ugh! She had me. I had not only opened the door to the trap, but had cheerfully walked through and shut off any escape route behind me. I never saw it coming. It was a long distance kill shot. Perfectly sniped. Closing the pool is one of the saddest weekends of my year. Not because of the work--but because of what it means. The end of summer. Closing the book on the most joyous season of my year and ushering in the season of cold and darkness. I need a house on the other side of the equator to escape to during the upcoming seasons. I'm thinking of perpetual summer rotating between the U.S. and maybe Chile or Australia. In wine a wine region of course. All of this because I have to close my pool--the site of summer fun and frolic. I am fascinated with the views out of hotel windows, as many of you know. And so, as I was at the Embassy Suites in Denver again for a couple of days, I decided to do something a bit different--document the breaking of the dawn--especially since I was up anyway. I took a series of three images out of my window as the sun tried rising in the east the other morning. In this one--the sky is uniformly lit by the sun which is still minutes below the horizon. It was very dark and the iPad camera did a relatively good job capturing the scene. In the next one, the sun is just below the horizon--the orange glow can be seen. I love the way the light is reflected off the clouds. They shimmer and look silver. The final image is of the scene in dawns light. When should we go all in for the Orioles? My response-- two months ago! I was planning to do another blog on out the hotel window--but the O's played the Yankees last evening--and won what was the most important game in the past 15 years! And now tonight's game is the most important game in that same span. OMG--it is September and the Orioles are playing to win the division for the first time since 1997. Yes. This is the first time the Orioles have been playing for the post season since I've been a season ticket holder. They are tied for the second best record in the American league. I can't wrap my head around it. Neither can my family. Whether they actually make the playoffs or not is almost immaterial--but I have been wishing for a beltway World Series between the National and the Orioles, just because both teams deserve the recognition. I have some of the tickets for post season games--but I fear I will go broke supporting the resurgent O's which are arguably, one of the best teams in baseball. How can I possibly miss a game? How can I not fly to Tampa for the season finale when the O's will likely secure a post season playoff spot, or not. I saw on TV that over 46,000 people were in the Yards last night--and it made me happy that Baltimore, one of the premier baseball towns in America was back with a swagger. 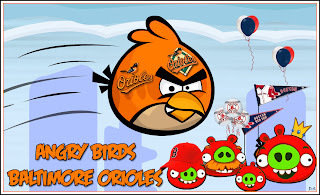 I read a Yankee blog and it seems that Yankee fans know the Orioles are for real. They are panicked! Can the O's really win the AL East? Or even wild card. Remember, at the beginning of the season they were predicted to lose more than 100 games and be worse than the Houston Astros? The Astros have already been mathematically eliminated from post-season play--the only team in baseball with that distinction and they are on track to lose about 110 games. I feel bad for their fans--I've supported a team that has been there. My what a few months will do. However it ends, the ride has been great and I love baseball. I committed a traffic infraction over the holiday weekend. Yes, I admit it--I looked at the traffic situation and then did something the sign said not to do. About 10 AM on Monday, Labor Day near a mall outside of Williamsport, PA, we had made a quick potty and coffee stop at a Burger King off Interstate 180. At the intersection onto the road coming out of the shopping area was a sign--Right Turn Only. I, of course, needed to go left. There was no traffic on the road. Seriously, no one. Why is this sign so absolute when there clearly are times when making a left turn is not a traffic issue. My guess is that during the busy part of the day, left turning vehicles back up into the shopping area creating congestion and fostering risky driving behaviors as people attempt to turn into tight traffic spaces. But, I don't know because we were the only car at the intersection. Am I allowed to evaluate the situation and make a conscious decision that obeying the sign does not make sense? Nighttime, red traffic light. No other vehicles or headlights in sight. Anywhere! Why am I waiting for the light to turn green? Yet, I do. Sitting at a red traffic light on a one way street in Ithaca, NY (Seneca and Tioga Street). Tioga does not cross Seneca at this point, the only turn is right and there, by definition cannot be any cross traffic or turning traffic--yet there is a "No Turn on Red" sign above the intersection. Why is this turn not allowed? A STOP sign at an intersection with great view of the approaching vehicles when attempting a right turn. Stop, or roll through treating the STOP more like a YIELD sign? Does a RED light make you STOP? I experienced the Dr Jekyll and Mr. Hyde of traffic situations this weekend trying to complete the trip first to, and then from Upstate NY. First, I am happy that we (Chris, Makayla, and I) got away for the weekend to see family. So, if this sounds like complaining, it isn't. The traffic just was. The trip to NY on Friday afternoon was an experience. The Baltimore beltway going north to I-83 was at a crawl for much of the way--and we departed at 12:30PM to attempt to miss the crush of late holiday travelers. Undaunted we continued on as we had expected such a mess. Traveling north on I-83 still in Maryland we encountered the first of three major accidents we would experience along the way. As traffic slowed to a stop and emergency vehicles were passing us on the right we were able to extract ourselves form the highway onto a parallel road and get around the accident. We also saw a very nice policeman giving a frustrated driver a ticket for crossing the median in an attempt to reverse course. Total delay -- about 20 minutes. Accident number two was in PA just before Harrisburg. The traffic stopped just past an exit ramp and I thought we were doomed. But, at least for a bit as the emergency vehicles were arriving, they were allowing two lanes of traffic by. I was amazed as I watched one ambulance arrive and take up one of the lanes of traffic just after we passed the scene. Delay: 15 minutes. By now the frustration factor was rising in the car. Clear sailing until Selinsgrove, PA. No accident, just slow traffic causing us to wait at every traffic light along that stretch of US 15. Delay: About 10 minutes. At this point I think I am out of the woods because from there to Corning, NY (our first stop on the trip for dinner with Tim and Stephanie and their family) is usually a fast trip. But no, along Route 11 headed to PA 147 to join Interstate 180 for the swing through Williamsport, traffic is at a stop--I can see the turn, but it is not moving. 30 minutes later after a heated discussion in the car we head over the mountain and rejoin Route 15 and head north. Original scheduled arrival time in Corning: 5PM. Actual arrival time: 6:30 PM. Ugh! The return trip was a breeze by comparison. There was only one accident, along the Baltimore beltway where we slowed from 60mph to 40mph. Total driving time: 5h 30min. Even with the occasional rain we made great time screaming through everywhere we had waited on the trip north. It is hard to believe the difference a couple of days can make. 1. Happy Labor Day. Enjoy the holiday. 2. I was rereading my blog from September 2009 and I reflected on the item about trying to remind people that there were still baseball games to lose. This year, the Orioles are in the middle of a pennant race. 3. Writing of the Orioles--I am still pinching myself to be sure I am not dreaming especially after they won the series against the Yankees over the weekend. 4. Well, it is back to home today. I have a broken car to fix and a bunch of stuff to do before the holiday weekend ends. 5. Last evening, sitting around a bonfire as evening fell, I enjoyed watching the stars come out and looking for the satellites which were flying overhead. It was a beautiful, quiet evening. 6. I saw the Milky Way last night--something that does not happen where I live in Maryland. 7. The rabbit in the yard was spooked away by something just moments ago. I wonder what? 8. Traffic. I will be sharing the road with too many other drivers soon. 9. The golden rod is in bloom everywhere. Autumn is at hand. We visited Americana, Sheldrake Point, Thirsty Owl, and Goose Watch. A whirlwind afternoon in Central NY with a lot of other wine lovers. There were a lot of other people out enjoying an idyllic afternoon doing the same thing. All of these wineries have stunning views of the lake and provide nice interpretation of white wine, which are really the best varietals grown in the region. The Rieslings were generally great. Every attempt at a red wine resulted in a thin interpretation which left me wanting something more. Americana has a large selection of wines which they do generally well. We continue to buy many of their whites to enjoy with our friends. I enjoy their tasting room and the ambiance of the winery done in a barn. Their new selection of Rieslings are especially good and come in a variety for every palette from dry, to semi-dry, to semi-sweet. They all had a vibrant character which made them very enjoyable. Sheldrake Point does dry wines and has a really enjoyable white blend called Luckystone White. We make a special trip to the winery for this wine. And it was on a great sale, too. Sheldrake Point was designated as the NY Winery of the Year, so the place, located right on the shore of Cayuga Lake is really worth the visit and the dry wines re especially good. Thirsty Owl, another winery with a great view, is dabbling in the reds in addition to the whites and provided a nice red wine using the Chancellor grape. But, their white wines are why people visit the winery. The final stop of the day was Goose Watch, another winery with another great view and a nicely done tasting room. They provided some very nice whites, but I felt their offerings this year were not as desirable as some of the other wineries we visited. They are good wines--don't get me wrong, but just a bit above average. Nice drinking but not spectacular. All in all it was a great afternoon. My parents were real troopers to dare to head out onto the wine trail with us--and it was nice to ave them along for the afternoon drive along the west shore of Cayuga Lake. with the games but a memory. it's just that the toys have changed.